Here is the final fruit of my labor. Manga Deny, though it looks simple and mostly unimpressive, it is one of my most ambitious works of 2006, a relatively artistically fruitless year for me. I say ambitious because all in one night I painted my first scene in perhaps ten years, started the path towards intentional discovery of a new style (manga), and a bit of putting it all together. Drove by work to pick up a small canvas. I rummaged through the storage closet and decided which art supplies would be useful for the project. I was able to locate some plastic palette dishes, 3 brushes, and a selection of acrylic colors left over from my basic design class at PSU. I decided on a jungle setting, perhaps because Fred the Monkey would be in the scene. A vague memory caused me to look up the cover art of an old SNES game, The Secret of Mana. I printed the image for inspiration. It probably didn't influence my jungle except perhaps my attempts at mixing colors. While at Target I searched for art brushes only to discover they don't have brushes of any variety (perhaps availability changes seasonally? ), not even for home improvement! So I had to make due with what I already found around the house. Completed the acrylic background painting. Details (fine black outlines, sun, yellows and highlights throughout) were added with Copic markers over the acrylic. Read the interesting overview of the Manga comic style as presented in Manga Mania (Christopher Hart). I browsed through the artwork in the book and tried to quickly absorb some inspiration. In preparation for my Manga drawing, I followed one of the step-by-step drawings in the book, sketching a simple youthful head in the manga style. 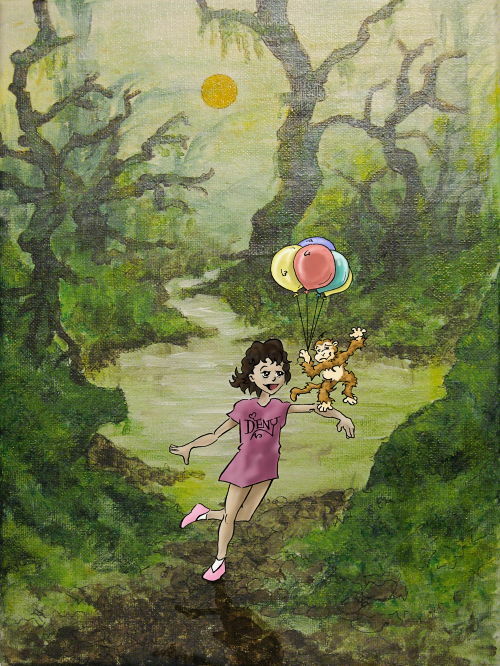 Penciled the outline of the girl's figure and the monkey with balloons. The pencil was erased and covered with a black ink pen with varying line thickness. Converted the line drawing to 2-bit (black and white) in Paint Shop Pro and redrew several of the shifty lines with my graphics tablet and pencil tool. Created a layer with just the outlines. Created another layer beneath the outlines and digitally painted in each region with a choice color, adding dark and light variations and blending for illusion of depth. Softened colors and applied an art media filter to give the colors a faint painted look and texture. Digitally photographed the finished acrylic painting, color and lens corrected, cropped. Positioned the figures over the background, added basic shadow and printed on glossy paper, matching size of the original painting exactly. Cut out printed figures and back-taped them onto the painting. This digital final version is technically the best because the incorporation of the elements is seamless. The cutout and taped version is a little less professional. Unfortunately I didn't have a way to paint the figures directly in the painting because the details would be too small, and the brushes I had were poor.